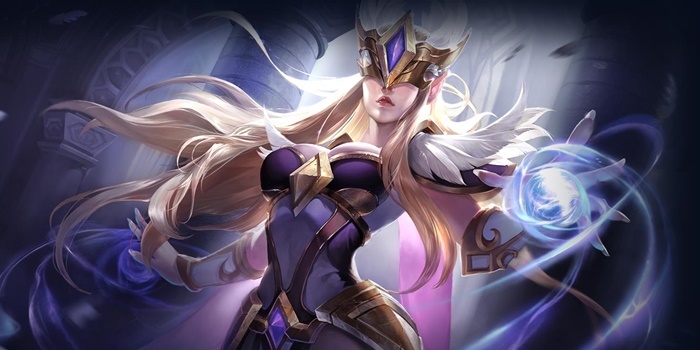 A guide for Arena of Valor's Ilumia, the High Goddess. Ilumia uses her Divine Light to whittle enemies down before stunning all with her Cataclysm. Ilumia is a mage who specializes in dealing crowd control and harassing enemies with her long range abilities. Her primary skill, Divine Light, allows her to poke enemies from afar with explosive orbs of light. Her Ultimate, Cataclysm, reveals all enemy heroes on the battle field before striking at them with beams of light, allowing her presence in fights from great distances. Good at Poking – As a mage, Ilumia can handle a lane by herself early game. Divine Light has a low cooldown and can be used to constantly barrage enemies from afar. Additionally, it gains a piercing effect and minor knock up when enhanced by her passive, Goddess. Global Presence – Cataclysm can effect heroes no matter their distance from Ilumia. Cast it whenever a fight breaks out to either stun and damage enemies or force them into repositioning mid-fight, giving your allies a moment of unreturned assault. Low Movement Speed – Ilumia has a very low movement speed and no movement abilities at her disposal. This makes it difficult for her to traverse the field as well as leave her very vulnerable to assassins and marksman in fights. Ilumia will have to play extremely cautiously in order to survive engagements with the enemy. Fragile – Ilumia has low defensive stats and very little in terms of abilities that can protect her from enemies. Divine Light offers a minor knock up when empowed by Goddess and can push enemies back with Banish, but that’s it. The goddess will have a very hard time dealing with enemies who manage to get next to her and will have to build tankily to have any hopes at survival. Ilumia will generally need to go down the middle lane. She will have a hard time roaming due to her low mobility, so try to time your movements carefully so that you can effectively help out the side lanes. After reaching level 4, she’ll need to switch to prioritizing team fights as her ultimate can easily turn the tides of a battle. Split pushing is also an option, using her abilities to push down minion while supporting team fights with her global ultimate. Divine Light should be focused first, it being her main source of damage. Its low cooldown and added effects when modified by Goddess make it a clear choice over Banish. Stick to lanes and avoid advancing into enemy territory whenever possible. Ilumia is unable to take much damage at all and will be easy prey for enemy damage dealers. Solo Fights: Never face enemies alone as Ilumia, especially late game. She has no way to escape a fight after it has started and can’t stand up well to direct engagement. Team Fights: Poke at enemies with Divine Light, keeping any potential attackers away with Banish. As the fight picks up, use Cataclysm to disable and damage the enemy team, giving your allies a window of advantage. Cataclysm has long delay before landing and is therefore easy to escape. As such, it is important to save it for when enemies have settled into the fight and have become too focused on their battle to dodge. Ilumia has a very hard time escaping bad situations. Use Banish and an enhanced Divine Light to slow the chaser down as much as you can while running. Banish additionally grants a movement speed boost, which can be used to run from battles gone bad. Goddess – Passive – Using any 2 abilities will strengthen the next Divine Light cast within 3 seconds and refresh its cooldown immediately. Enhanced Divine Light pierces opponents as it travels, has higher damage, and knocks up on hit. There is no time limit as to when the two skills have to be cast. As such, the passive can be prepared by casting a skill early so that you will only have to cast once before it triggers in a fight. Goddess’ counter resets on death. Prime Goddess before fights by activating a single ability. By doing so, you can quickly string together Divine Light > Enhanced Divine Light > Banish > Cataclysm > Enhanced Divine Light. Divine Light – Ilumia fires a divine light in the specified direction, which explodes upon contact with enemies in range and deals 350/410/470/530/590/650 (+0.45 AP) magic damage. The divine light deals 1.6 times damage and knocks enemies back when it is enhanced by Illumia’s passive. Divine Light is the bread and butter of Ilumia’s kit. It is her major source of damage and what a player will be using the most often when playing as the goddess. Casting Divine Light into tall grass is a good way to check if an enemy is hiding inside. Divine Light has a miniscule cooldown and thereby should be cast often to keep up a high damage output. Banish – Ilumia knocks back enemies in range using Banish, dealing 190 (+0.4 AP) magic damage. Enemies hit are also slowed by 30% for 1 second. Increases Ilumia’s movement speed by 30% for 1 second if an enemy is hit by the ability. While Banish is primarily a way to push enemies away, the damage should not be ignored. The damage can fill in holes between Divine Light casts. Enemies are pushed away from Ilumia based on their position in relation to Ilumia when she casts the skill. Enemies are pushed to the edge of Banish’s effect, no matter how close they were to Ilumia when the skill was cast. Cataclysm – Ilumia summons a divine matrix that explodes after a short delay below all enemy heroes, dealing 640/820/1000 (+1.0 AP) magic damage to enemies near those heroes and stunning them. Ilumia also gains enemy vision for 3 seconds. Cataclysm has a 2 second delay before its effects are applied. This can be really easy to escape, so it does not work well on running enemies. Ilumia is very squishy and thereby an easy target once approaced. Act quickly when she casts Cataclysm especially if the enemy heroes are hunting your team down to avoid being crippled or killed. Ilumia’s ultimate plays a pivotal role in teamfights. Building as much ability power as you can will help ensure that your abilities greattly impact the battlefield. Taking Violate, Devour, and Hex will do just that. Some players may want to try to compensate for Ilumia’s low defenses instead, so Indomitable, Benevolence, and Valiance. Tanks post a big problem for Ilumia. As her unenhanced Divine Light explodes on impact, tanks will generally make hitting squishier characters behind them much more difficult. Furthermore, their control effects can easily put Ilumia in a place to be quickly defeated. Maintain distance from tanks, ignoring them in favor of squishier heroes when the opportunity is there. Not only able to take abuse like tanks, warriors will have the damage and gap closers needed to be extremely dangerous to Ilumia. That said, most have an easier time approaching fragile foes, so should still be considered dangerous. Keep a careful eye on warriors to avoid falling to their abuse. As bad as warriors are, assassins are every bit worse. A natural counter to mages, assassins can immediately close in on their targets and burst them down to nothing. Ilumia has no way of naturally dealing with this herself, so assassins should be avoided entirely when not already engaged in a team fight. Ilumia will hold similar footing with most mages. Divine Light has a lower cooldown than most other mage abilities, allowing Ilumia to spam it and continually harass her foe. Additionally, missing is much less of an issue. Keep moving unpredictably to avoid enemy fire, lobbing your skills at them whenever able. Marksmen have formidable amounts of damage, but generally have to stand still while dealing it out. This can make them an easy target for Divine Light or Cataclyse. You won’t be able to outpace their DPS, however, so engage after the marksmen has chosen another hero as their target. Ilumia’s Divine Light deals consistent, moderate damage rather than a heavy nuke right away. As such, the heals and shields of supports can heavily alieve the punishment she has been giving enemies. Deal with supports whenever you can, their low health making them an easier target to your Divine Light. That said, do your best to oavoid their control to avoid being left completely open to enemy attacks. Why is there many different builds? For the sg recommended builds, they are different to the ones that in strategy builds and the strategy builds is also different from the hero item builds. Which is the main build that I should follow up for my hero?